Loggers will soon go to work alongside a quarter-million daily travelers on Interstate 5, where Sound Transit must fell 5,300 trees to make room for future light-rail tracks. 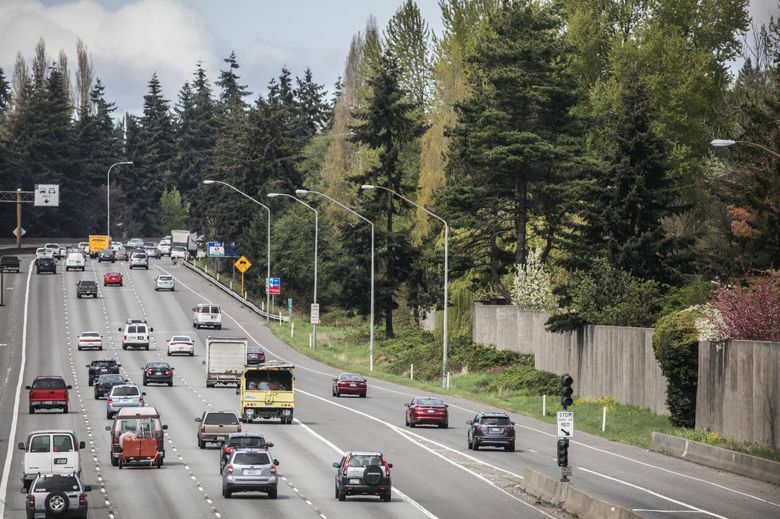 The job, which could start by the end of April, is a first step toward building the 8 1/2-mile corridor from Northgate to Lynnwood that voters approved in 2008. Trains will travel on the ground and overhead by 2024. The thickest groves line the hillside east of I-5 through Mountlake Terrace, where Douglas firs have grown undisturbed since the freeway was built in the 1960s, and often earlier. 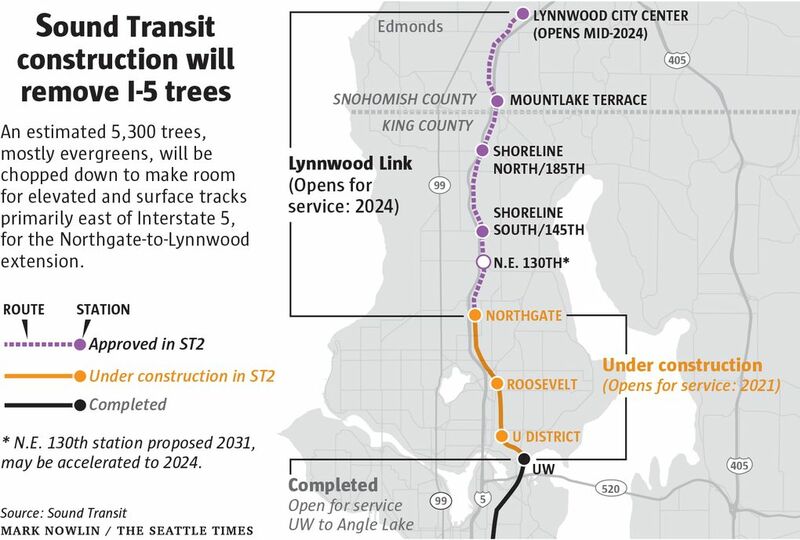 Mountlake Terrace will lose 2,318 trees, the most among the four cities along the route. Transit managers called the removal “saddening” and “disheartening” in written summaries, but emphasized that 20,745 new trees will be planted, or four times the number lost. The new trees are smaller and will need a few decades to mature. About 47 percent will be evergreens, and the rest deciduous. Cutting will require six months, while trucks will often enter or exit the construction zone using freeway interchange ramps, said Rod Kempkes, Lynnwood Link executive project director, in a news briefing Monday afternoon. Afterward the ground will be bare three years, until the underground foundations, 28-foot-wide track platforms, retaining walls and electrical wires are installed, and replanting can begin. The timber, worth perhaps more than $1 million, will become contractor property. Teams are also discussing plans to grind the branches so residents can receive wood chips for personal use such as gardening or playgrounds, maybe at the Shoreline South/145th Station site, Kempkes said. Logs are more likely usable for lumber instead of export, especially because trunks must be felled in short segments for safety’s sake next to the busy freeway. Besides tree removal, contractors will demolish buildings, relocate utilities, and clear equipment-access paths this summer. Some trees to be preserved are already surrounded by orange plastic fence. As crews proceed, starting at Northgate, they’ll break a 25-foot-wide road for trucks and drilling equipment. The clearing will gradually extend north, between interchanges. “It will be like a pioneer road, when the logging trucks go,” Kempkes said. Train tracks will go mainly east of I-5, until a long bridge crosses over the freeway from Mountlake Terrace into Lynnwood, where there tend to be more leafy, small trees near wetlands to the west. Fred Wilhelm, deputy project director, said new trees will be at least 3 feet tall, and transplanted from 5-gallon buckets of soil, instead of the smaller 1-gallon size. That’s meant to ensure a head start, for greater survival rates than typical transportation projects. In addition, Sound Transit gained access to maintain the trees for 13 years instead of the typical three years from the Washington State Department of Transportation, which owns most of the land. Replacement tree species will vary by location, so a leafy tree that grows up to 25 feet can go beneath the tracks, while conifers that grow 40 feet or taller are planted to the side. Public meetings about the project are scheduled in Mountlake Terrace on Thursday from 6-8 p.m. at the Nile Shrine Golf Center ballroom, 6601 244th St. S.W. ; and in Lynnwood on April 25 from 6-8 p.m. at the Lynnwood Convention Center, 3711 196th St. S.W. Similar tree-cutting is expected to the south in Federal Way, where long stretches of trackway south of Angle Lake will go through wooded areas near I-5.